This contains major spoilers for the series finale of Doctor Who, Death in Heaven. If you haven’t seen it, stop reading here. I really enjoyed Death in Heaven. The highlight was Michelle Gomez as the Mistress. I’d love for her to somehow come back. I also think Peter Capaldi is a fantastic Doctor. In fact, though I mostly enjoyed this season, I think Capaldi has been better than the scripts he’s had to work with. I’m looking forward to next year. He should really come into his own, with a companion that will be written just for him. I liked his relationship with Clara, but it was clear she wasn’t the right companion for him. But I had some major problems with the finale, and judging from the online reviews I’ve seen, I may be in the minority. Let’s start off with what stood out to me the most, then take the rest in no particular order. Mistress and the Cybermen may not be around to savor their victory, but they achieved it nonetheless. Think about what they did: they successfully robbed every known grave on Earth. Every tomb in every cemetery is now empty. Think about the seismic shift in how people grieve/mourn/worship that must create. How will people react to their beloved ancestors not only being taken from their resting places, but then blown to atoms? There would have to be a seismic shift in most people’s world- or religion- view. What would the world’s religious leaders say? How would society react? And what becomes of all the now vacant cemeteries? Yes, everyone who dies post-invasion will continue to be buried, but in some respects, a huge chunk of the past is now moot. Honestly, the new series Doctor Who has never been able to make the Cybermen interesting. Even when they were introduced, they weren’t the real thing; they were parallel-universe versions. By the time Neil Gaiman got to them, all he did was manage to make them faster and sleeker. Their motivations? Backstory? Unexplored. And that’s a shame since they have such a rich backstory. Want Cybermen done right? Big Finish did it with Spare Parts. All this series finale did was finish them off. There was no indication that the Cybermen were working with Mistress, no indication that they had any motivation or agenda of their own. By all appearances, Missy was using them as she would any other weapon. The Cybermen were merely tools, same as a gun or a tank. And they are so far from their Mondas/Telos origins that they might as well have a new name. These are Cybermen in name only. Most reviews are calling this episode a touching goodbye to the Brig. Nonsense. Seeing the Brigadier as a Cyberman was just painful. I’ve been watching Doctor Who since I was a child in the 70’s and I have seen every existing episode. To see a man who fought the Cybermen in his second appearance turned into one was just sad. Yes, it was great that he overcame his programming and saved his daughter, but when was the Brigaider ever a murderer? That laser bolt truly did come from out of the blue. You can argue that he saved the Doctor from becoming a murderer, you can debate that he was a soldier doing what soldiers do in war, you can argue that he was just doing what had to be done. But again, when did the Brigadier ever kill someone in cold blood? And you can’t blame it on his cyber-conversion. If he overcame his programming to save his daughter and not fly off into the sky with the others, then you can’t use it as an excuse here. This scene just sullied the Brigadier’s memory. And then he became one. Seriously? On the show, it has been established that the Doctor is too well known. He wiped his memory from people’s minds and erased himself from the entire Dalek network. Behind the scenes, the producers said that the Doctor was too big and had to go back to being more mysterious . So what do they do? They make him President of Earth. Yes, on the show the Doctor protested, but the bottom line is when they wrote this episode, they wrote him into being President of Earth. ← Today in History: November 10th, 28,000,000 B.C. A lot of people have said that Moffat is to blame. & that Peter Capaldi’s Doctor has been written in a way that reminds me, personally, of Dr. Gregory House, M.D. rather than Doctor Who. I thought ” Dark Water ” was very weird. The dead being entombed in tanks of water ( presumably a solution containing those popular microscopic creatures, nanites ? ) so they can rise as Cybermen. It almost reminded me of the Colin Baker episode set on a mortuary / cryonics facility where the dead & those in stasis were being used to create a newer class of Daleks. They never really answered what happened to Danny Pink at the end of ” Death in Heaven “, either. Is he still a Cyberman ? I get images of him as a British version of Iron – Man zipping around in Cyberman armor. Is Clara leaving the series ( Part of me hopes so, Her time as ” The Impossible Girl ” got old ) ? I can see the House comparison, though not totally, and I heard Clara was leaving during the Christmas special, so I guess I don’t really know. This whole season has been full of contradictions. There’s no Heaven/Heaven exists, there’s no such thing as a race of perfectly hiding creatures/there it is (though in the face of irrefutable evidence the Doctor says no.) And are we to assume that Clara and Danny had a sexual relationship? How else to explain Orson Pink (barring further developmenta)? That leads to awkward questions from the kiddies. All the Doctor needs is a cane, a bottle of Vicodin, a 2 – 3 day growth of stubble, & the transformation would be nearly complete. This 8th season ( I like how in the U.K., they call seasons ” series ” ) has been unusual. I think it was a tad morbid how they had Matt Smith’s Doctor calling Clara twice while at death’s door. Peter Capaldi’s Doctor comes off as acerbic, sarcastic, condescending. Before him, Colin Baker was considered to be unpleasant by a fair number of fans. C. Baker was done in by bad writing in general and John Nathan-Turner’s view of the show in particular. I like him much better in audio. That ” electric ” outfit didn’t help matters either. Colin Baker would’ve preferred an outfit like Wm. Hartnell’s Doctor. I don’t care for the whole idea of Doctor – Companion ” ‘shipping “. The Doctor & Rose, then Martha pines after the Doctor, then Amy decides she’d like it if they had an affair ( Never mind that Amy was engaged then married ), then CLARA. Is Doctor Who a soap opera set in a time – space vehicle or is it science fiction ? They may have picked Peter Capaldi to quash the ‘shipping & romance. I’d like a return to the First Doctor and Ian dynamic. Maybe Capaldi should travel with a man of action to balance his more cerebral Doctor. (Think Captain Jack minus the sexuality.) The love interest thing has been done to death. This guy already has two wives! River and The TARDIS. I think that would work, or just let the Doctor have 1 companion / set of companions at a time. They stay for 1 series, maybe 2, then leave, or maybe pop back in again ( Like Madame Vastra, Strax, Jenny ” The Paternoster Gang ” ) from time to time so they don’t wear out their welcome. Like Jack Harkness – He wasn’t in EVERY SINGLE EPISODE. Now that ” Torchwood ” is apparently on indefinite hiatus, Jack could come back from time to time even while being on CW’s ” Arrow ” series. The best companions were the Doctor’s equals- Romana, Capt Jack, River, etc. Harry Sullivan was fun but you can only take his bumbles so long. The companions were / are also there to keep the Doctor in check, make sure he doesn’t meddle too much with those pesky ” fixed points in time “, & maybe start getting delusions of god – hood. Remember ” The Waters of Mars ” episode & how he was ” The Time Lord Victorious / Triumphant ” & he apparently thought he could change rules with recklessness & disregard for causality ? All this after he lectured Donna about changing those fixed points in time in the ” Pompeii ” episode. This is why he needs companions, otherwise he’d careen through history, changing it with careless abandon ( Preventing the assasinations of Lincoln, Kennedy, Gandhi, MLK, making sure that Hitler died as a child, preventing the sinking of the Titanic, the attack on Pearl Harbor, ad infinitum….. ) & perhaps unraveling history. & the reimagining of the Cybermen kind of reminds me of the revision of the Cylons’ back – story in RDM’s Battlestar Galactica. They went from being machines who outlived their organic creators to being creations of humans in the 12 Colonies. Then in Doctor Who, you have Cybermen showing up as a creation of a human genius whose own body is failing, Cybus. I think that the writers for Doctor Who pinched the revamped Cylon storyline from BSG & gave it a couple of twists of their own. All true, but this didn’t seem like an alliance. Missy called the shots and the Cybermen were obedient foot soldiers. But I do like that they can fly. The Master often regarded his allies as ” tools “, I think Missy is no different. Flying Cybermen – well they have Daleks that can hover now, so…..
Missy is no different, but the Sea Devils, Daleks, etc had their own purpose and agenda. These cybermen didn’t. 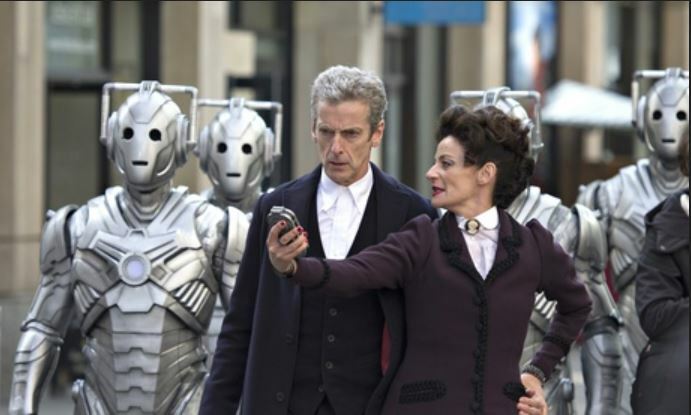 Missy was written beautifully, the failing was the cybermen. I’ve heard people say they’re doing the Master as female because the long term plan is to make the Doctor female sometime in a future regeneration. This would be a test run, of sorts. Oh, yeah, completely OFF TOPIC, I know, but have you caught ” Sherlock ” on BBC AMERICA ? It’s pretty good, considering it’s almost a complete break with tradition ( Mostly because it’s set in 21st century U.K. rather than Victorian England. & one of ” Sherlock “‘s writers / producers has worked for Doctor Who, I believe. It’s quite good. They even introduced Mycroft. I like it, though I found it a little bit cold at the beginning. Better than Elementary on CBS by far. Matt Fruer played him at least once. But that was traditional Sherlock Holmes. Tom Baker once did an homage to him – deerstalker cap & all – as the Fourth Doctor. He seemed a natural to play Sherlock. Used to LOVE ” MYSTERY ” on PBS, but I was more partial to Hercule Poirot. I’m a big fan of the old Margaret Rutherford Miss Marple movies. As for Holmes, Hammer did a really nice version of The Hound of the Baskervilles.with Peter Cushing, Andre Morell, and Christopher Lee. I’m waiting to see more of ” Sherlock “. I couldn’t really get into Victorian Sherlock Holmes, for some reson, even though he’s pretty much a cultural icon. Like I said, ” Poirot ” was more my taste, 1920’s, the era of flappers, Gershwin, Art Deco, Orient Express, Egyptomania, ragtime, etc. Enough defining/redefining the Doctor. Want to see a manipulative Doctor? What Troughton in Tomb of the Cybermen. Meanwhile, time to get back to plain old good adventures. Doctor lands someplace, gets involved in local troubles, fixes them, no pop psychiatry. Oh, yeah – Another piece of insight about this episode. The Cybermen ( Or maybe I should say THE DEAD RETURNING TO LIFE AS CYBERMEN. ) flying off reminds me of a negative version of what some people call ” The Rapture “. Graves opening, dead rising into the air. At least it seemed that way to me. I can imagine the royal mummies in the Egyptian museum & other places, the bodies encased in volcanic ash at Pompeii, Arlington National Cemetery, the Vatican catacombs. Not only our dead, but part of our global historical heritage, cyberized. All to be ignored, it seems.